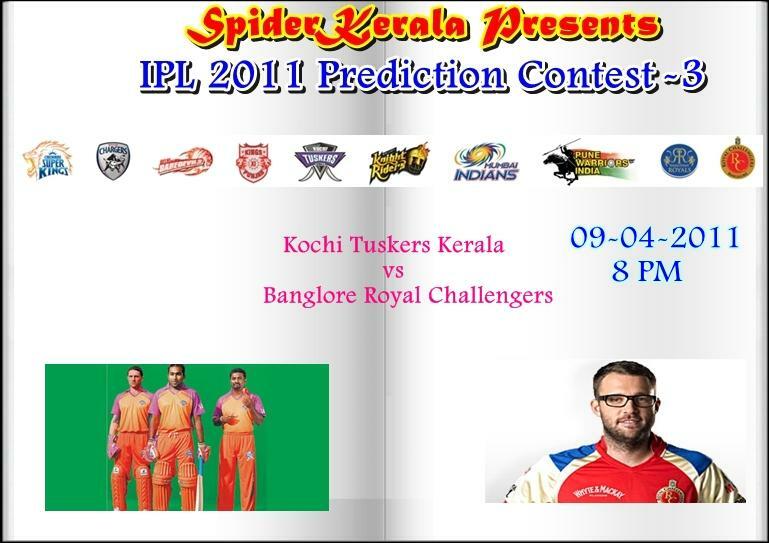 IPL 2011 Kochi Tuskers Kerala vs Banglore Royal Challengers Match Prediction Contest is the new active contest from SPiderKerala. Kochi Tuskers Kerala vs Banglore Royal Challengers Live Match at Kochi will be a thriller to watch.Banglore Royal Challengers vs Kochi Tuskers Kerala Live Match will be the 3rd match of this edition of IPL 2011. Now spiderkerala members can participate in the prediction contest. We congratulate the lucky members who have really got their reward from participation in the Ultra Mega World Cup Contest which had been running successfully for a month. New members can join the contest by registering here. After registering in SpiderKerala leave a comment here. Only those members who register their name in the above thread will only be eligible to post their predictions here. 1. Which team will bat first? 2. Which team will win the match? 3. Who will be judged as the Man of the Match? Royal Challengers Bangalore will bat first. Royal Challengers Bangalore will win the match. A.B.Deviliars will win the man of the match award. 1.Bangalore Royal challengers will bat first. 2.Bangalore Royal challengers will win the match. 3.Tilakaratne dilshan will be the man of the match. 1. Bangalore Royal Challengers will bat first. 2. Bangalore Royal Challengers will win the match. 3. Virat Kohli will be the Man of the Match. 1) The prediction for this match will close at 6 PM on 09-04-2011. 2) All 3 predictions should be correct for the eligibility of the cash reward. 3) If more than one person predicted correctly then the cash reward of Rs 100 will be shared among them. 4) The Contest will be available till the final match. I am happy to be a contestant this time. Here is my prediction for the questions asked. This is going to be a very interesting match with Kochi Tuskers making their debut in the IPL against a strong team.